Last week’s contract signature marked an early Christmas present, as the festive season is in full swing and I look forward to new year’s resolutions and our Trust in 2016. On 16th December, our Chairman, Richard Samuda, hosted our annual festive gathering for partners, staff award winners and senior clinicians. I was struck by the diversity of people with whom we work – from small third sector bodies with almost no permanent employees,through travel agencies supporting communities with historic local links, to large universities. And that diversity is reflected individually too. If you read my monthly report to our public trust board you will know that each month I update the board on progress with our equality and diversity promises and objectives. Making real change happen on issues of discrimination and unconscious bias, in our services, employment and leadership practices matters greatly. And we have far further to go, perhaps especially in how we support local residents originally from east and central Europe. 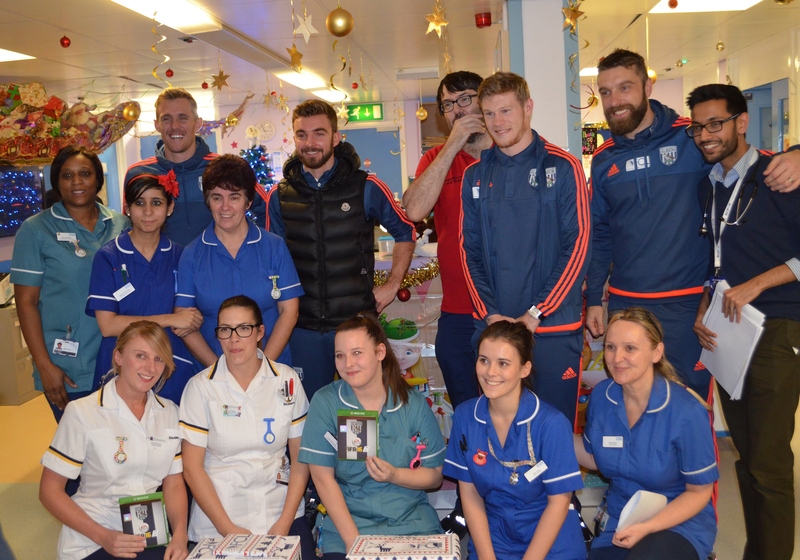 West Bromwich Albion Football Club visited our children ward. The new Midland Met is now just over 1000 days away. Contract signature makes certain that the change will happen. We have a clear site to build on and every expectation of delivering a fantastic new facility on time. We will be tracking the build on camera, and taking every opportunity we can to draw attention to important details of the new hospital which will make it either a great place to work or a calm place in which to be cared for. There are many examples, but as I write today, I am thinking of things like the high number of single rooms, each with infection control lobbies, or the great sight lines for nursing and HCA staff on each ward. The Winter Garden looks out over both Birmingham and the Black Country and will be the place where both visitors and staff can spend time. Any new hospital development ends up with discussions about the “BBC”! Bus timetables, beds and car parking – so to be clear about each in turn. Discussions with Centro are continuing but we know we gave an on-site terminal, as well as a major new pull off stop along Grove Lane. We need to make sure that services reach out across the communities we serve. We have 669 beds on site, and intermediate care beds as well in Oldbury, Rowley Regis, West Bromwich and on Dudley Road. We are confident that we can improve our length of stay and prevent some avoidable admissions, working with partners. As I have written before, we have reserved some “plan B” space already if our expectations are wrong or things change before or after we open. The car parking in Midland Met is underground, and allows people to enter directly into the building by lift without going outside. Meanwhile, we keep much of the car park space on Dudley Road at City and car parks too at Sandwell. These will be operated by the Trust and we are confident we can meet expectations on enough spaces, and of course on security and comfort. We will need however to play our part in local and regional efforts to reduce car use, given the impact on the environment. The focus on Midland Met must not distract from the reality that, as now, most care we provide as a Trust will be provided at home, by our outstanding community childrens’ teams, our midwives and district nurses. BMEC, the Birmingham Treatment Centre and Sandwell will be the largest centres we run for outpatients and diagnostic services. The re-development of Sandwell Hospital, into the Treatment Centre model, is part of the Midland Met project and a key part of Right Care, Right Here. We will open a large urgent care centre on the site, alongside intermediate care, chemotherapy, short stay surgery and outpatients, both for adults and children. We recognise that developing services in Rowley Regis, Tipton and Wednesbury matters, but it is important to recognise that that is not instead of services at Sandwell, which are being developed further, with significant investment. The site is and will remain the headquarters for the Trust and the hub for our education and research activity. 2016 will see increasing NHS emphasis on the outcome of the Carter Review. This looks to benchmark hospitals and share good practice. Although there is lots of that in our Trust, there is plenty to learn too. Our Black Country Alliance provides a tremendous opportunity to take the best of what is done at Walsall, Russell’s Hall or in our Trust and make it common to all. As a larger entity we can buy some goods and services cheaper, and will look to do so in the months ahead. In February we host our first clinical conference across the partnership at Walsall’s football stadium, and I am sure there we will identify priorities from our service leaders for change, as well as opportunities for shared research, such as the recent stroke collaboration that we hosted. That sense of good practice spread is equally true inside our Trust, a large, diverse organisation. I wrote last month here about our inspections and the results from that are being compiled now. Safe to say that whilst we have improved, we are not yet where we want to be. There remains too much variation in how we work, and to much reliance on individuals. As we move towards implementing our electronic patient record in 2016 and 2017 it will be important that we adopt singular, standard practices, and make sure those are our future approaches not just our historic styles. Winter always seems to be a time of huge emphasis on the NHS. We are well prepared, but always dependent on the actions of others as well as ourselves. Flu vaccination has gone well, but not as well as last year’s record breaking effort. We have seen falls in delayed transfers of care, but at any given time at least a full ward of patients are with us who would be better cared for elsewhere. And of course where there are backlogs or bottlenecks elsewhere in the local NHS, ambulances may divert our way, as they should. Our staffing position is improving but we need to recruit faster if we are to be able to cope with the pressure. I very much hope that contract signature on Midland Met will give waverers the final shove to join the organisation in our exciting future.